For years, major industry players like Microsoft, Google and Intel have been using the OKR framework to disrupt the status quo in their organization and drive significant growth. It’s a model we typically see in the enterprise tech space, but there are takeaways and practices that are applicable for teams of any size and in any industry. When you break it down, the concept is based in simple business practices: identify where you want to be (objectives) and set the plan for how you will get there (key results) – and make the process continuous. Teams shouldn’t be reviewing progress at the start and end of each period – performance needs to be managed daily, weekly and monthly. It’s a continuous approach to goal management that shifts company culture. We breakdown the performance ROI of OKRs (or goal management) and some action items to consider when rolling out this type of framework. Read this post if you need a refresher on the concept of OKRs (what they are, how to use them). What kind of ROI can you expect from OKRs? The Sears example isn’t necessarily the benchmark for OKR ROI, but it is an indicator of the positive cultural and financial impact to the organization. Using a goal management system is part of a larger cultural approach to performance management. 3.5x increase in productivity – we looked at company data on Align, and after four months of consistent usage of a goal management system, companies doubled the priorities completed per period. 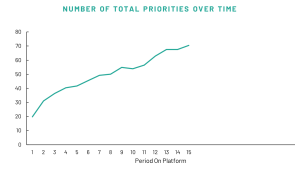 After 15 months of adopting the system, priority completion increased 3.5 times from month one. Increased engagement – companies that huddle (daily and/or weekly) have 5% higher eNPS scores (a metric to measure employee engagement) compared to those that don’t. While huddling isn’t a key component of the OKR methodology, it does facilitate communications and focus around the metrics that matter. You’re giving everyone on your team a voice to share their updates, opportunities and risks. Engagement is a metric that affects the companies bottom line and can signal potential problems for an organization. A 2018 Gallup study reported employee engagement is at an all time high, but about 53% of employees still fall in the “not engaged” category. Increasing employee engagement, can contribute to higher productivity, increased retention rates and 21% increase in profitability. Seeing ROI from these systems is not something that happens over night. And it’s not something everyone on the team will embrace with open arms right away. These methodologies are proven. It’s not simply something people feel will work based on anecdotal comments. There is actual data and metrics supporting the adoption of a more formalized goal management system. 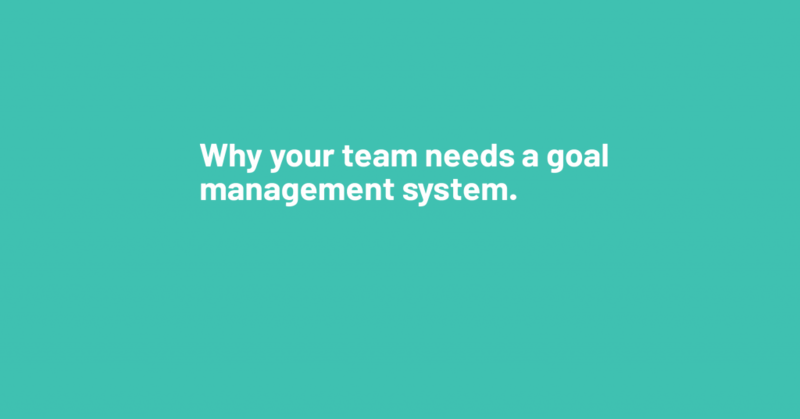 To encourage teams to stick with it, you have to keep the catalyst for adopting goal management at the forefront. When your team buys-in and commits to the change, you’ll begin to see results within the first few months. The results will compound after a year and so on. Ultimately, companies should consider the opportunity cost of not implementing this type of system. The traditional approach to goals and performance management is outdated, costly and creates a lot of wasted time. How much more could you be achieving if you had a formalized system in place? In short: OKRs create data points for you to evaluate ROI for your business. It’s not a significant time investment and can create positive cultural and financial value for the organization. Alright, so how do I rollout goal management or OKRs to my teams? We outline six important considerations below. Start with your BHAG (big hairy audacious goal). For Microsoft, it was a computer on every desk and in every home. Sounded crazy at the time. But it sets the long-term vision for the organization that decisions and objectives should be based on. What makes a good BHAG? It should be a unifying force for your employees that aligns with your company’s mission and values. And remember to think long term – where do you want to be 10+ years from now? Embrace transparency. Strategic plans, the company vision, and company performance are not exclusive to the C-Suite. Every individual needs to know where the company is heading and how it’s going to get there to do their jobs well. Involve individuals in their own goal setting, monitoring and management. This instills a sense of shared ownership in the company’s success. Don’t set goals that can’t be measured. And don’t set goals that are too safe. If you set goals you know you’ll achieve, you’re underutilizing your team. Goals should be healthily ambitious and all goals need a quantifiable metric assigned to them. Measurement means qualifying the goal with a unit of measurement as well as making it time bound. This gives you the data you need to continuously monitor progress, see what works, what didn’t, rinse and repeat. Identify the metrics that matter most. What are the 3-5 most important metrics that indicate success for the entire company for that period? It can be a sales target, revenue, website conversions, etc. You can have additional target metrics that you monitor, but you need to know the 3-5 most crucial and keep everyone focused on those. Cascade goals from the top down. Going back to the BHAG – use that as a litmus test for defining organizational goals, consider how this goal will get you closer to that long-term vision. Set departmental or team goals that ladder up to the organization goals and individual goals that ladder up to those. There needs to be an evident link between individual, departmental and organizational objectives. Keep lines of communication open. Part of evaluating progress involves face to face conversations once you have performance data. Create daily, weekly and monthly meeting cycles to raise red flags, identify opportunities and keep teams focused on the key objectives and metrics you’ve outlined. It sounds like a lot of meetings. But effective meeting rhythms will save time and pointless email chains in the long run. In short: rolling out goal management systems like OKRs have six key factors for success – long-term vision, transparency, measurement, more measurement (focus), alignment and communication. If you have questions about OKRs, goal management and how it can impact your organization, let’s talk!